HAVANA, Cuba, October 3, 2012 (ENS) – Poor maintenance of drains at an apartment block in central Havana has created a serious health hazard for residents. 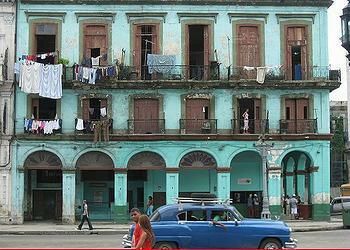 A maintenance worker says much of the Cuban capital is affected by blocked sewage systems. Blocked drains at 668 San Martín Road have flooded the sewage tank, polluting the cistern which stores water for drinking, cooking and bathing. “When a visitor comes to my home, I feel so embarrassed by the stench they’re forced to breathe in. No one can stand it,” said a woman who lives on the ground floor of the apartment block, where the hallway is flooded with foul-smelling water. Other residents say the blocked pipes mean they have to collect their feces in plastic bags and throw them out with the rubbish. Doctors who have inspected conditions in the building say the 36 people who live there are at risk of cholera, dengue fever and other illnesses. At least two children have been treated for infectious diseases in recent weeks. Yamilet López Montesino took her 13-year-old daughter to hospital after she fell ill. Medical staff asked about sanitary conditions at her home, and sent a team along to investigate. “Hepatitis A is a mild illness, but if it isn’t attended to properly it can become dangerous, Meanwhile, cholera, dengue, leptospirosis and salmonella can be deadly,” the doctor warned, adding that he had observed rat, mosquito, and cockroach infestations in the building. Dengue fever, now common in parts of Latin America including Cuba, is spread by the yellow fever mosquito, Aedes aegypti. In August, the Inter Press Service news agency quoted the Cuban health ministry as saying mosquito infestation had reached “critical” level in 23 municipalities across the country. Leptospirosis or Weil’s syndrome is transmitted from animals to humans. People living in the area say sewage has been a problem at the apartment block for some years now. An employee of the Sewage Management Company in the city said he is aware of the issues, but there was little he can do as the blockage is in the sewage mains pipe rather than inside the building. 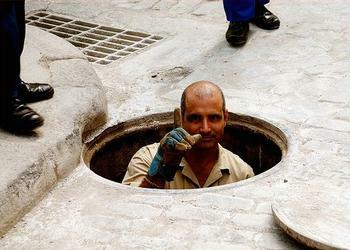 “We do repairs from the entrance to the interior, while others are responsible for repairs [under] the street. In this building, the flooding is due to a blockage in the [mains ] pipe,” he said. He said similar blockages in drainage pipes now affect more than 60 percent of Havana residents. Residents of the apartment block point out that things can be fixed when there is a will to do so. A burst drain at a shop just 25 meters away was fixed in under 24 hours. The shop, called La Mía, is state-run but rather up-market as it only accepts convertible currency, not normal Cuban pesos. Meanwhile, residents of the San Martín Road block have developed a rota for washing since their own bathroom facilities are out of order.